Yoga, meditations, massages, healthy food, a beautiful swimming pool, private sleeping cabins, an overwhelming tropical garden and super friendly staff. 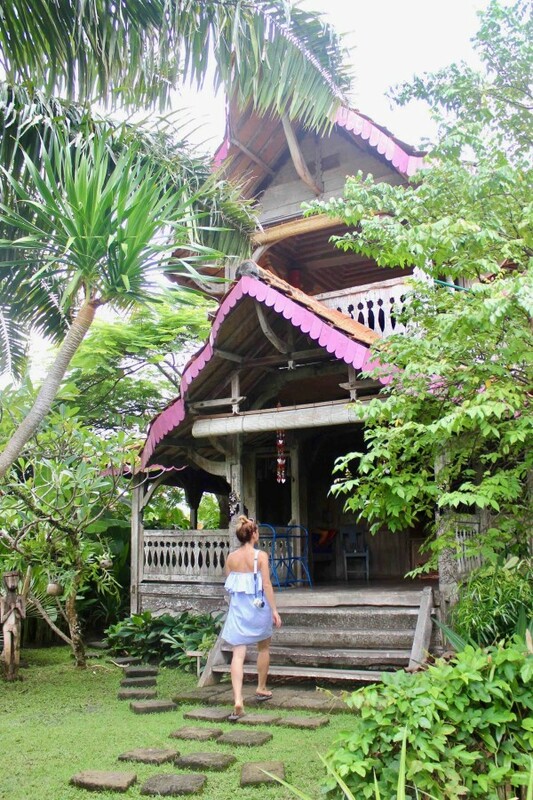 I haven’t even mentioned the comfortable big beds, the outside bathroom, and this all located close to the beach: Yoga retreat Desa Seni in Canggu is the perfect retreat to recharge. After a super busy year and some private circumstances, I needed some time to relax. Bali is the perfect place for that since there are a lot of healthy spots and yoga retreats on the island. 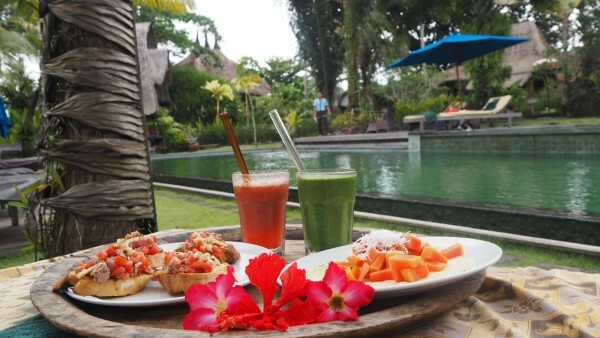 I was already in Canggu and I heard that Desa Seni is one of the best yoga retreats of Bali: they have the most experienced teachers, delicious fresh and healthy food, luxurious surroundings and a great service! That’s exactly what I needed. I wasn’t a big yoga fan, but ever since I took some classes at Desa Seni I decided to continue to practice yoga in Amsterdam. The retreat is located amid ancient rice terraces. You get a warm welcome when you arrive by the lovely women at the entrance desk of Desa Seni. Then a guided tour is waiting for you first before drinking a welcomes cocktail at the pool. The first thing you will notice is the relaxed and beautiful vibe of this retreat: The beautiful garden with colorful flowers, the big and comfortable sun bets and the stunning swimming pool was exactly what I was looking for. They seriously have thought about everything: mosquito spray, candles, incense, holiday cards to send out and a lot more. You get to chill in a zen location for a few days where everything is included and that is what you want when you go to a retreat. This Village Resort serves an eclectic Asian-Western cuisine with a focus on organic, healthy and fresh food. It has a vegetarian menu where delicious fish and veggie dishes from the resort’s own organic gardens are waiting for you. The restaurant is open to the public for breakfast, lunch and dinner. Desa Seni’s daily Yoga program caters to all levels and offers a variety of yoga styles, open to the community and led by a qualified, dedicated, and passionate team of teachers. Apparently Desa Seni has the best yoga teachers on the island. A lot of people come here to take part of the 5 yoga classes they offer each day: From Kundalini Yoga and Hatha (the most reckon one) to Sunset Flow and Fly High Yoga. They might be a but heavier than in your own country, but it has also to do with the weather (you sweat a lot). The classes are super divers and you feel great when your done. 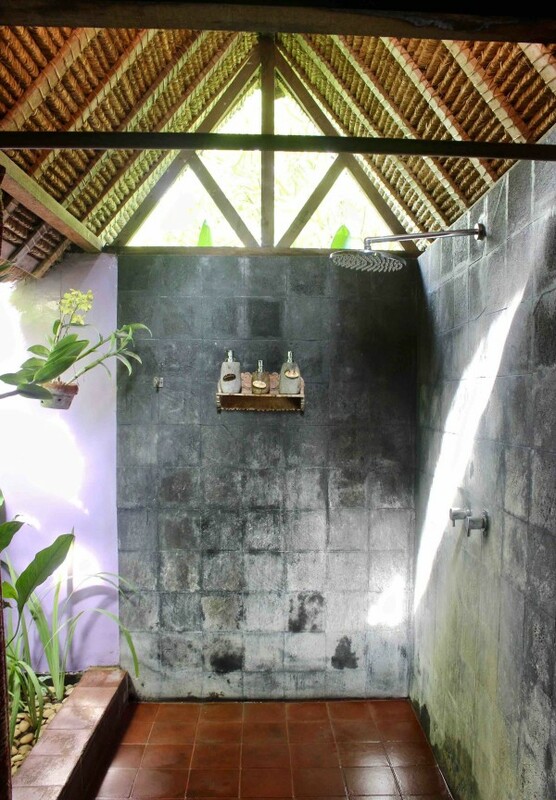 Desa Seni offers a variety of accommodations, all of which are antique wooden houses with beautiful terraces, sitting areas and private modern outside bathrooms. The interior of each unique house has been re-furbished to provide all the modern comforts, while the exteriors have retained the integrity of rural village life. Check the prices here. 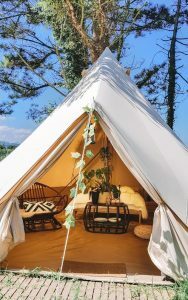 Room Rates include: Gourmet Breakfast – Daily Yoga & Meditation Classes – Unlimited Drinking Water – Complimentary Wireless Internet – Daily Ceremonial Offering – DVD & Book Library. We loved Desa Seni in Bali. Gorgeous place, delicious food and such a beautiful garden! Good to see the photos that bring back memories.